Though BC is the healthiest province in Canada, it ranks fourth from the bottom on self-reported mental health. We can do more to help everyone in BC have the opportunity to experience good mental health. We know that people with even the most complex mental health and substance use problems can and do recover in community when supported. We have some ideas about what we can do differently, by focusing on investing in community-based services and supports and building partnerships between governments and the Canadian Mental Health Association (CMHA) to make a difference. Our shared vision is for mentally healthy people in a healthy society. 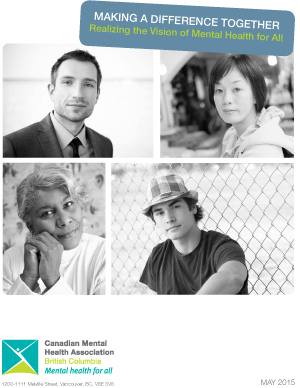 Released in 2015, this policy paper and summary frame the state of mental health and substance use care in BC, present a case for systems change, and offer three proposals for the government to work together with CMHA to improve mental health in BC.